Polenta flavoured with fresh herbs and lemon zest makes an excellent instant crumb coating for this fish dish. Serve with Waitrose Perfectly Balanced Oven Chips for a healthier fish-and-chip meal. In a shallow bowl, mix together the polenta, lemon zest, garlic and herbs, then season well. Pour the beaten egg into a shallow bowl, dip the fish in the egg and then into the polenta mixture, pressing it well onto the fish. Heat the oil in a frying pan and, when hot, reduce the heat to medium and add the fish. Cook for 5-6 minutes each side until the polenta crust is golden and the fish is cooked through. Remove the fish and add the lemon slices; cook for 30 seconds on each side until the edges catch slightly. 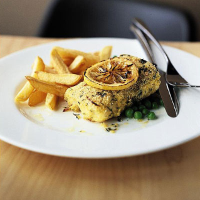 Serve the fish with the lemon slices, accompanied by Waitrose Perfectly Balanced Oven Chips and peas. Use the polenta and herb coating for other fish, such as plaice or sole. Add different fresh herbs, such as basil, chives or rosemary.